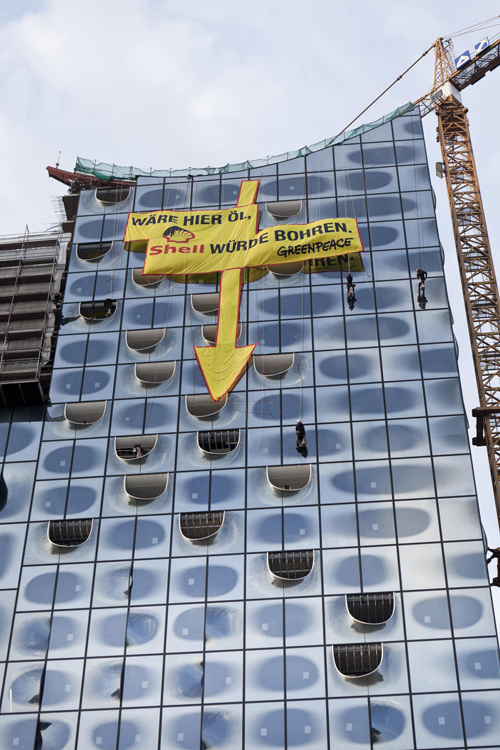 Greenpeace activists in Germany are putting warning signs to work in creative ways. From one of the largest buildings in the country, to the middle of meadows, people are taking on the task of capturing photos protesting oil drilling with signs and uploading them online. People are encouraged to take photos of themselves with the signs in various places that would be crazy to drill for oil and upload them to Green Action, a German social networking website. The signs play off the absurdity of Arctic oil drilling, given the extremely dangerous conditions. German volunteers display an arrow with a sign “If there was oil here, Shell would drill” at the Baltic Seas Beach near Scharbeutz. The warning sign idea came out of collaboration between Greenpeace Germany and the Ecosign Academy for Sustainable Design in Hamburg. Nicolai-Emanuell Stumpp, a student taking part in a seminar about Greenpeace’s Save the Arctic campaign, came up with the concept. Nicolai-Emanuell is from the Lake Constance area of southern Germany, and says when forming the idea he recalled when citizens immediately took steps to stop a company from fracking in his region. “I think most of the people understand a problem when it is in their own backyard. But like every home, the Arctic should also be protected,” says Nicolai-Emanuell. 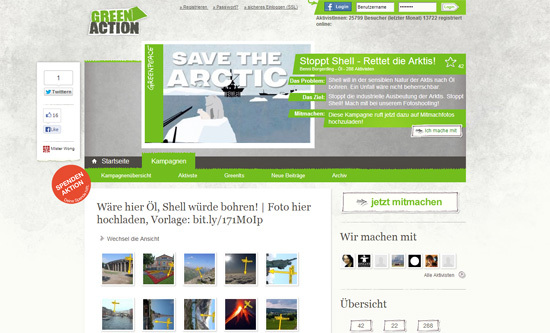 Green Action, a German social networking website, hosts an online gallery where activists can submit their arrow sign photos. He says he is very proud to see his idea implemented; noting he didn’t think one sentence could have such an impact. 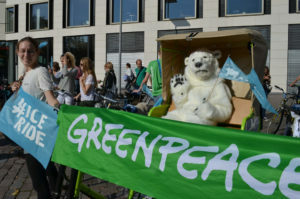 “But one thing is for sure: without all the activists of Greenpeace who are working on a voluntary basis, such a campaign would never have been realized,” he adds. Benjamin Borgerding, Greenpeace Germany web campaigner, says because of the potential to be used in so many different places the warning sign idea works well for the Save the Arctic campaign. The Save the Arctic campaign is gathering signatures on www.savethearctic.org to increase pressure on politicians and corporations to enforce a global sanctuary and ban offshore oil drilling in Arctic waters. Corporations, including Shell, want to drill for oil in the Arctic. The Arctic’s extreme weather and freezing waters mean there is no safe way to deal with an oil spill. The online petition aims to gather five million signatures, and currently has more than 3.9 million. “This Arctic campaign has been going on for one and a half years and will probably go on much longer, so with this action we hope to generally raise awareness for this issue,” says Benjamin, adding many people are unaware of the danger the Arctic faces. Greenpeace’s action warehouse and volunteers have been preparing the warning signs in all sizes and weights. Green Action, a Facebook-like platform for environmentally conscious people, has been a central tool where people can upload their photos with the warning signs. After uploading photos, users are asked to send a tweet to @shell with the hashtag #SaveTheArctic and the short link http://bit.ly/oeloeloel. An advantage to using Green Action instead of Facebook is users can easily add upload their own photos to photo albums in the gallery. Because Facebook is an important channel to spread ideas many of the photos are cross-posted, notes Benjamin. One potential challenge to be aware of is because people are uploading their photos directly, Greenpeace cannot control the types of images submitted. Therefore, Benjamin notes, someone needs to keep an eye on what is in the gallery to ensure there is nothing offensive. The warning sign initiative works well across different media channels, which is a major advantage, says Benjamin. On Aug. 23, Greenpeace activists unfurled a huge banner on the largest cultural project in the country — the Elbphilharmonie Hamburg concert hall. The building is well-known as it has been getting a lot of media attention due to various delays and costs. Benjamin notes this is an example of how the idea could be utilized for typical Greenpeace actions. “This is an idea that allows Greenpeace activists do big actions for which we are famous but also allows our supporters to take part and join in and also the way it connects online and offline in a very coherent way, so I think this is the biggest plus,” says Benjamin. He notes the Elbphilharmonie banner story was picked up by local media and also some bloggers who were particularly interested in the guerrilla marketing aspect. People can also download an editable template and a toolkit to create their own warning signs. At the time of his interview with MobLab, 450 photo entries are in the online gallery, which Benjamin notes is substantial. The large number of entries is a result of having volunteer groups engaged in the project, says Benjamin, who are actively coming up with ideas and taking photographs. A day of action was held in July, which saw all volunteer groups in Germany utilize the idea and upload photos to the gallery. There are approximately 4,000 Greenpeace volunteers in 105 volunteer groups in Germany. 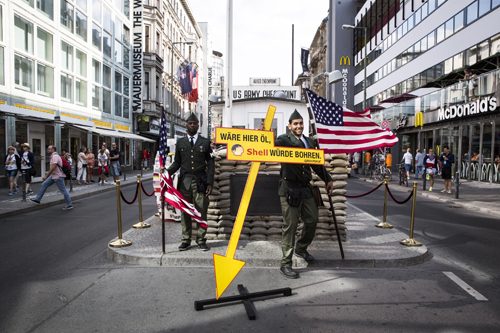 Greenpeace activists in 50 cities took part in the day of action. The media reach the warning sign activity has attracted contributed to achieving more Arctic awareness. “What we wanted to achieve with this has happened,” says Benjamin. A professional photographer has also been engaged in the project and toured around with a small team of people finding lots of interesting spots to take photos. 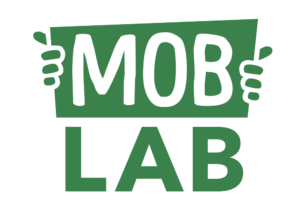 The resulting images have been used to promote the campaign and have been well-received on social media. Beyond Germany, people in the Netherlands have taken up the warning sign initiative. In Austria, the text is being edited to say “If there was oil here, Gazprom and Shell would drill,” referring to the joint venture Gazprom and Shell have declared in the Russian Arctic. The invitation is open for more people to contribute and take part in the warning sign activity. “It would be great if more countries joined us,” says Benjamin. 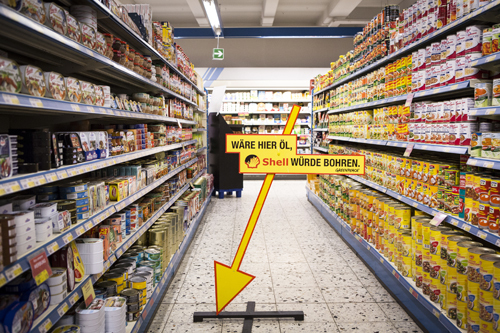 A photo featuring the sign inside a German supermarket. If other Greenpeace offices want to work with the idea, Benjamin notes Greenpeace Germany can assist through providing raw files. Benjamin says there are plans to do something bigger with the submitted photos. “In the end we will use all the entries that went into the online gallery and do something crazy with it,” he says. 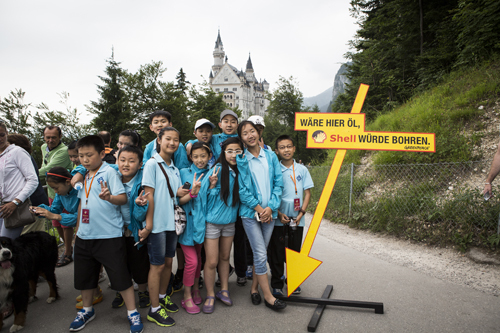 Top photo: Tourists pose with one of the signs in the front of the Neuschwanstein Castle.